Han China had an established centralized government, low taxes, and the Han had less harsh punishments than before. They had a Civil Service System with 18 ranks. They were government jobs that civilians could attain through many examinations. It fell because mainly rich landowners had all the wealth and the last rulers had been chaotic. Wang Man took over the empire to help the common people. They constantly rose and fell. They did not last long and their greatest accomplishment was the Grand Canal. They revived the Civil Service System. The Tang fell, however, because of high taxes, lots of internal fighting, and lots of external skirmishes. They ruled in southern China. Two important inventions of the Song are the movable type and gunpowder. The Ming were against outsiders disrupting their peace. Outsiders had to pay to get in. This was the time of the voyage of Zheng He. His voyages were made with a remarkably large fleet for the time. He convinced 16 nations to send tribute to China. Only government officials could trade in 3 ports. Smuggling was still done. This increased the economy of China and spread European ideas to Asia. The Manchus seized Beijing from the Ming. Like the Ming, they tried to isolate themselves from the outside the world. British traders smuggled opium into China to get the Chinese addicted and increase trade. This was known as the Opium Tea connection. In 1839 Britain fought against China in the Opium Wars. Britain Won. The people wanted to share wealth. It was a movement done by the Hong. The rebellion was put down by outside nations. Dowager Empress Cixi (1862-1908) governed with traditional values. The Spheres of Influence were areas where trade and investment was controlled by a foreign nation. The Qing also started the Open Door Policy which opened trading with the US and China. Japan Feudalism led to the decline of a central power. The naturalistic religion of the Japanese was Shinto. The capital was Heian which is present day Kyoto. The Hein had to compete with the Fujiwares family. This is the time of the samurai. The samurai were loyal warrior bodyguards for the lords. Their demanding code was the Bushido. A shogun is a supreme general for the emperor's army. 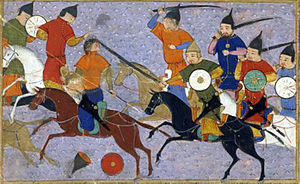 During this period, the Mongols invaded. This drained the treasury and caused a revolution. Daimyo-warrior chieftains who took old feudal estates when the samurai were not paid due to the economic downfall from the Mongol invasion. This society was structured by feudalism that resembled Europe's. The first country to have contact with Japan from Europe was Portugal. They loved the traded goods from Europe but the Christian missionaries they sent ruined the trading system. Japan became isolated. Until 1853 when Matthew Perry came into the port of Tokyo with massive ships that were years above the tech of the Japanese. This impressed them. So they signed the Treaty of Kanagawa and trade was restored. Emperor Mutsuhito thought the best way to resist westernization was to modernize. So they studied each country. They were impressed with the navy of britain, the military of Germany, and the education system of the United States. They tried to expand into Korea. Major deserts in Africa are the Sahara and Kalahari. The native tsetse fly is known for two very important things: Protecting the rainforest from traditional development using livestock and also for warding off European invaders. Animism is the beliefs that spirits in people, animals, plants and other natural forces play an important role in everyday life. Griots were the African storytellers who kept alive and passed down the unwritten histories of their people. During the 11th century, a lot of African leaders adopted Islam. This religion was spread by trade and the settling of Muslim merchants and teachers in the states south of the Sahara desert. Gold and salt were the most important trade items for the Soninke people in Ghana. The Nok people were early African living around modern day Nigeria. They are best known for their use of iron ore. Most of the southern half of Africa was covered by the early peoples migrating. Their slash and burn farming technique caused this necessary migration to new places. As they migrated,they brought with them the technology needed for iron smelting. The kingdom of Aksum was on the rugged plateau on the Red Sea in modern day Ethiopia and Eritrea. Aksum made it's living off of trade routes with Persia as well as the Mediterranean and Indian Oceans. It was the only ancient African kingdom to have developed a written language. The decline of this ancient kingdom came from the increasing Muslim invaders and the isolation from their Christian ports, settlements, and allies. Great Zimbabwe is situated between Zambezi and Limpopo. No one knows for sure why this land was abandoned but it is obvious that farming had been worn out. These people were east of Mali and Songhai. The rulers of these people depended on crops and had great power over the people. The most important items traded in the city of Zazzau were enslaved persons. The Yoruba Kingdoms were in Benin and Southwest of Niger. The Yoruba kings were considered divine and the most important people both religiously and politically. Their two largest kings were Ife and Oyo. The Mali empire was in an area south of what is now Ghana. A man named Mansa Musa was the empires great military ruler. He was able to expand the territoryto 2 times the size of Ghana. His religion and power allowed him to build mosques in Timbuktu and Gao and he divided his empire into provinces ruled over by less powerful governors. The Mutapa Empire extends all the way from the Zambezi River to the coast of the Indian ocean. It was taken over by Matope- Mutota's son. In Benin, an Oba was the ruler who claimed to be a descendent from the first king, Ife. The Portugese traders are significant to Benin because it began the trend of European interferance and had begun enslaving africans. The people of Songhai resided near the bend in the Niger River and Gao. Two notable leaders are Sunni Ali and Askia Muhammed. Sunni Ali created a trade city and conquered land with an army on horseback. Askia Muhammed built up an efficient tax system and was known for governing his people well.